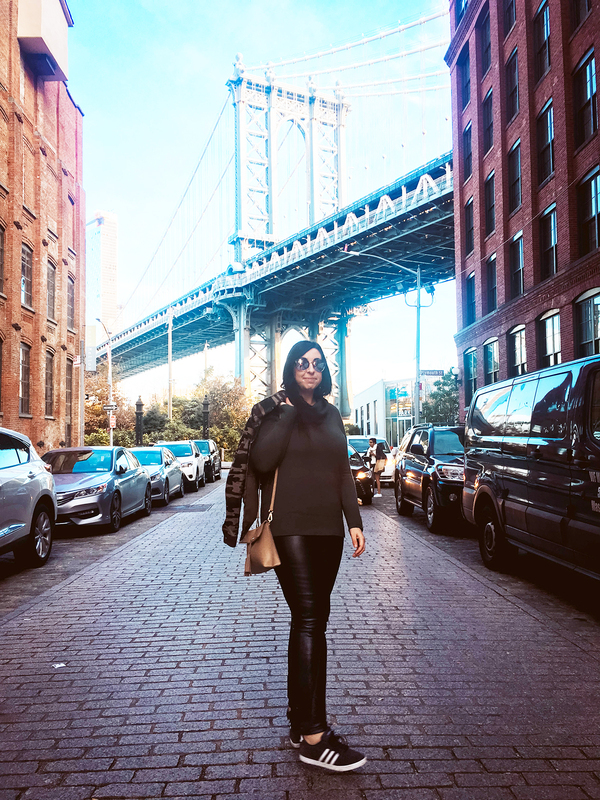 This outfit post about Leather Leggings for the city + the country contains affiliate links. Please read this blog’s disclosure post for more info. 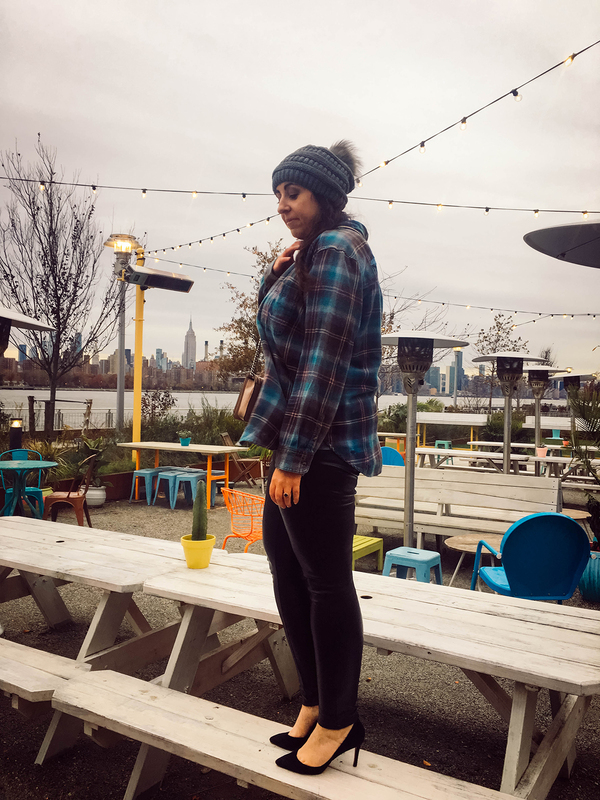 I didn’t realize it until I went away from NYC for college but there is a definitive city uniform — especially in the Fall and Winter! It centers on black, grey and white. It’s fun to play around with those three yet I like life with a little more color. This year I’m playing around with using black, grey or white as an outfit base and then adding a pop or subtle infusion of color. This outfit represents the latter. 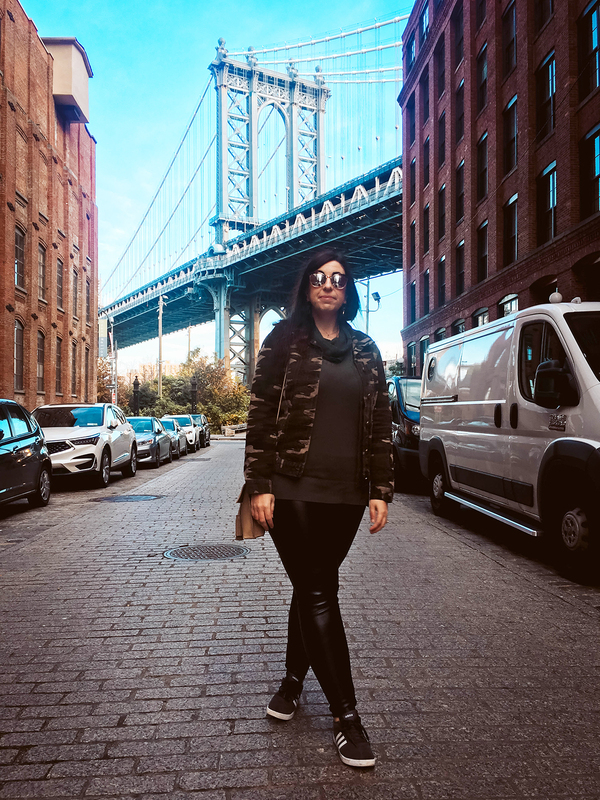 It turns cold in NYC without warning! 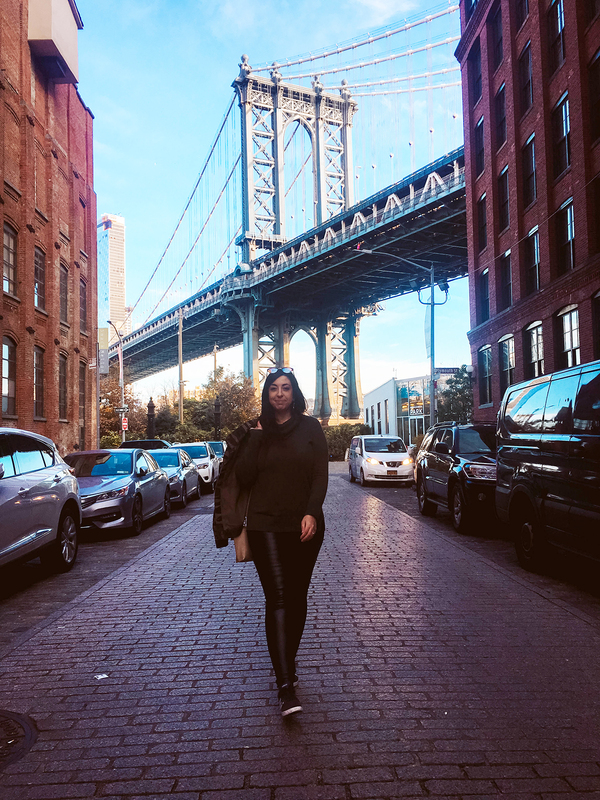 I’ve been delighted by the Leggings in Faux Leather (now $40) from LOFT! I’m delighted that LOFT just restocked them this morning! They come in a classic black and a warm fig color and they are nice and warm on!! 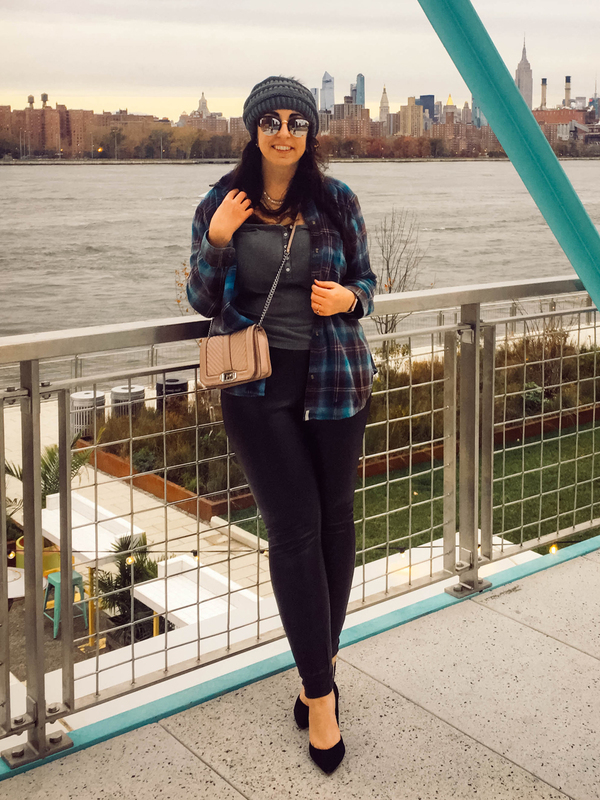 Over this OOTD post and one more on Friday I’m going to show three casual outfits for these amazing pants. I like them more than my Spanx leggings and that’s saying a lot! First up, early morning light in DUMBO. 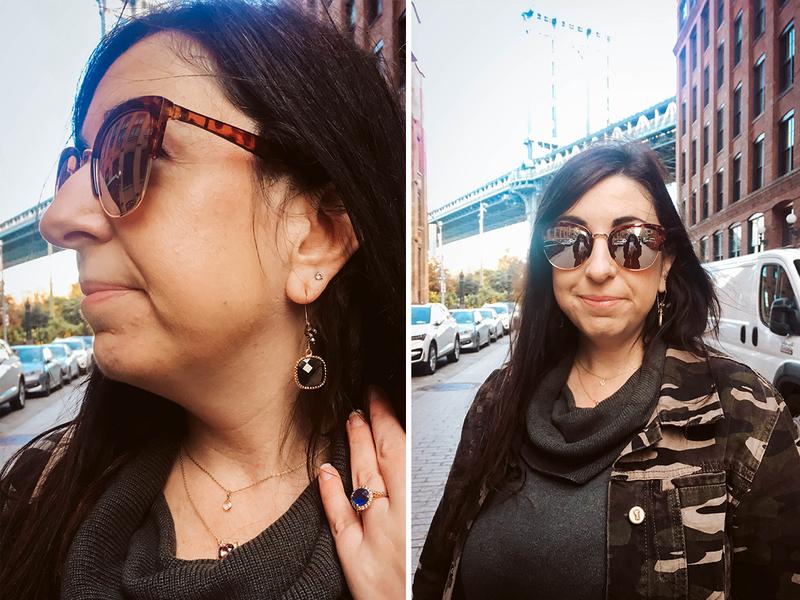 Fall colors inspired me to take the green cowlneck sweater and camo jacket out for a spin. My jacket has inspired touches of purple in it — it’s old, but I’ve linked to LOFT’s version which also coordinates nicely. This time of year, my day job involves a lot of going from event to event or store to store ensuring that my juniors and clients are working well together. Comfort is key! I like to fashionable yet not too dressed up unless the event calls for it. This outfit is ideal — I can run after a bus or across avenues if needed! It’s also an ideal weekend look. Here’s another way to style the black version of the leggings. There’s something so funny about the way we people in the tech industry dress. I notice a concerted effort to dress down, or to wear very high-end clothing in a way that looks dressed down. I’m totally OK with this but still take strides to look put-together. For a recent event (as in, yesterday) I realized that even a cowlneck sweater might be too fancy for the client I visited, so it was flannel all the way! Do you notice differences in the ways different industries dress too? AE has some amazing flannels. (Here’s another one on me early last Spring, shop it here.) 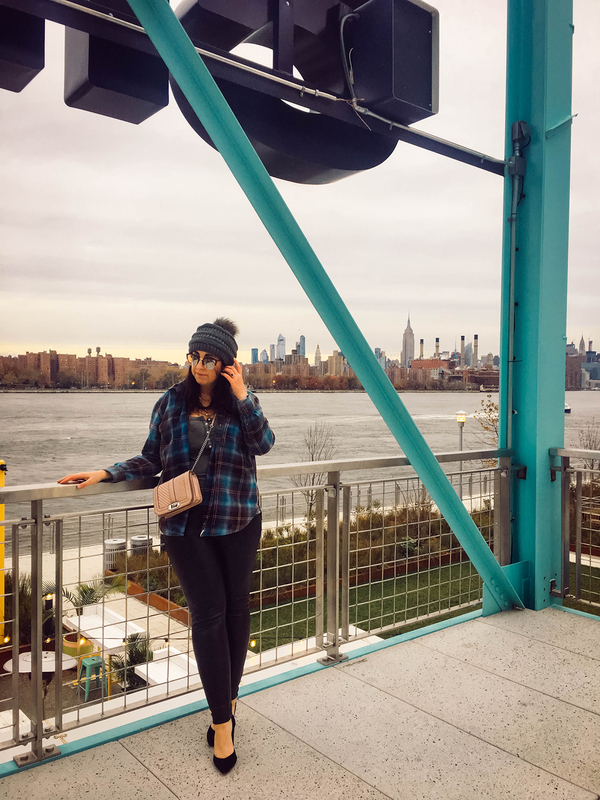 American Eagle and Aerie remain one of my secret styling weapons! Have you checked them out recently? Here are some of my current picks. So many of their items coordinate beautifully and make getting dressed each day easy. 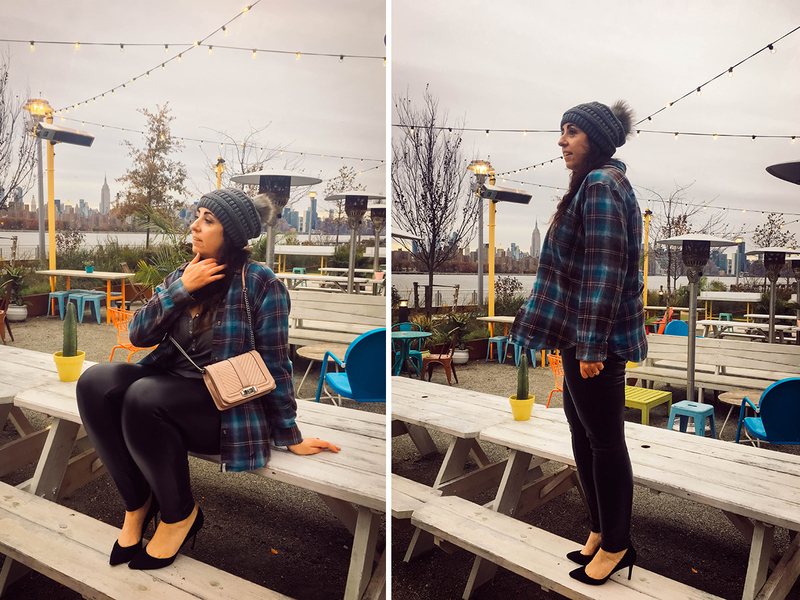 It was simple to find layering tops that work super well over my beloved new faux leather leggings. 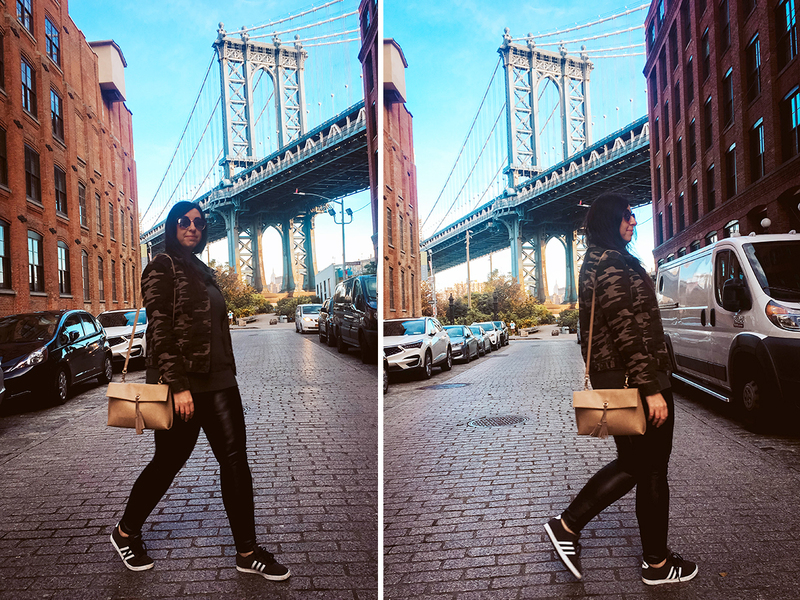 That’s two ways to style the leather leggings, both for the city. Coming up on Friday — how I style them for a weekend out in the country. 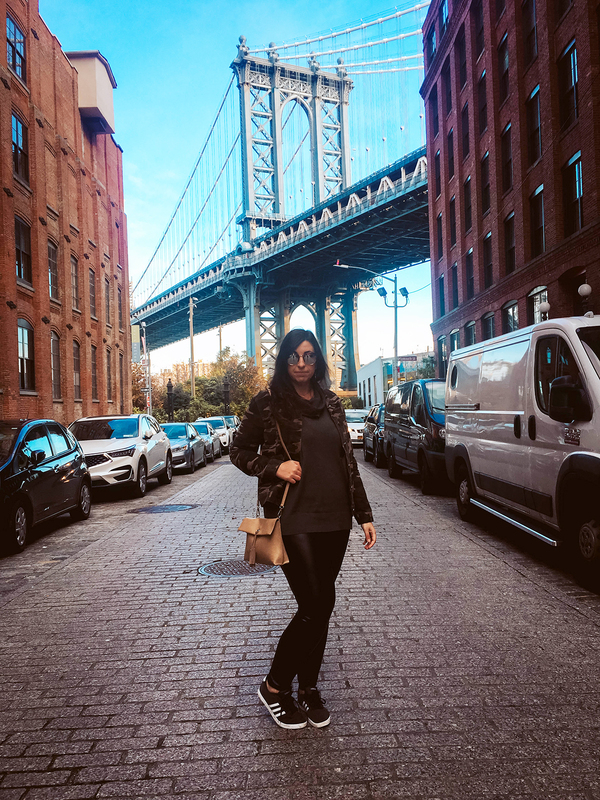 Bonus news — right now at LOFT, pants and jeans are $39.50, including the Faux Leather Leggings featured in this post!! LOFT has spectacular fits, especially its Julie/Curvy fits for hourglass figures like mine. If you’re a straighter or less curvy shape, the Marissa/Modern cut will be perfect for you. They also have long, petite and plus sizes in most styles. Below, some of my picks from this promo. Oh Roxy I love these outfits! I live in Chicago and I struggle with how to look cute in the cold weather. We've already had a bit of snow! I know you've mentioned these leggings before and I was tempted. Now I'll take the plunge and get them. We're about the same height, did you buy the regular or the tall length? Between this and the Anthro promo there is so much temptation today. They would be perfect for Chicago! They keep so warm even on really windy days. I bought the talls, they pool just a bit at the ankles when I wear flats. I love seeing you mix old and new pieces! I actually own the version of that Anthro camo jacket with the red embroidered roses. It will look great with your first outfit idea. Agree on AE's flannel. It's pretty much all I wear on winter weekends. So glad that the faux leather leggings are back in stock! I've been eyeing for them to come back haha! I love the way you styled them because they can totally be dressed down or dressed up! Thanks Rach! Yes you are so right. I had to email like 10 people this morning to let them know the leggings were back. These are highly sought after. Can't wait to see how you style them. I love the pop of print the camo jacket brings to your look! So cute. Thank you very much sylvs. Thanks for these great styling ideas Roxy! I get tons of inspiration from your outfits and shopping posts. I may try the leggings in the fig color. You should Lindsey! I find that the fig color works with black and brown nicely, as well as lavender and light pink. Yes it's totally a city girl thing!! I love how you styled them two ways! Thanks Caitlin!! And a third way coming Friday. I really like both of these outfits! I have the Spanx leggings but now I want these too. I have a flannel top too so I could do the second look. Really like your outfit in the liketoknowit app today too! So glad you’re doing outfits again. I may like these even better than my Spanx moto leggings. They're just awesome. And thank you!!! You look great in those leggings. I wouldn't be able to carry them off at all. You also got some great shots at Dumbo. Thank you Tanvi! I have seen women of all different shapes and sizes pull off these leggings, I know you could do it! And yes DUMBO is absolutely gorgeous especially with the Fall leaf colors! Im still on the hunt for faux leather leggings; Ill have to try these ones out! Thank you Nam for the lovely compliments. 🙂 It's wonderful having you here. Give me the NYC uniform all day, every day! I love those Loft leggings .. that price is great! Agree! I can't believe they're under $40 right now. Great leggings! Love the second more casual look with them! I have been LIVING in my faux leather leggings for the last few weeks. They really class up an outfit and they are so comfortable! HUGE fan of leather leggings! So versatile! Agree! They're just as comfy as jeans, if not more so. Love the last look and will try to recreate! I haven't pulled the trigger on these leggings as I am in Canada and the promotion doesn't apply! Sold out in my size in stores ;( so with shipping and customs the cost climbs to about $160 Cdn for faux leggings! Oh my god that's so lame Danielle! I wonder why the promo doesn't work in Canada? Have you looked into any of the cross-border shipment services? A lot of them are in Washington or Maine, though it's probably not worth it for just one item. Thanks for this tip – will check that out.